Kelly Mulholland, wise old head in what was a young team. He was a great calming influence on the team, and really helped to put them on the right path to the future successes they have come to achieve. 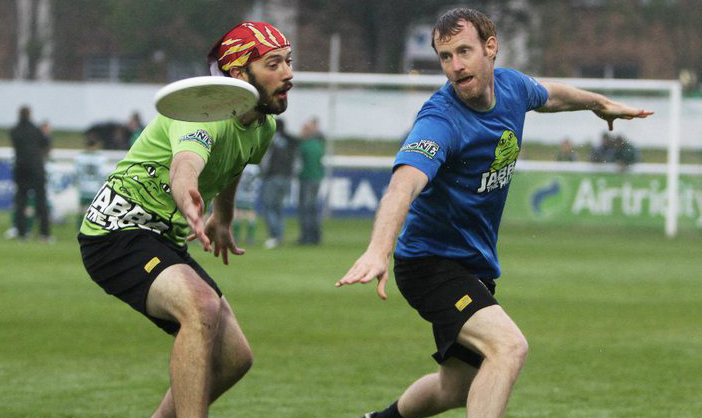 Had you heard anything about the Irish ultimate scene before you came? If so, what? Nothing at all really. Nor had I really looked into it. I vaguely recall during a prior visit to Ireland (probably in 2006), seeing ultimate frisbee played in a park somewhere on the north side of town, from the window of the Aircoach. It got me excited. I first met you at Herbert Park summer league / pick up, how did you find it? The next day I bought boots, socks and shorts, and on Sunday there I was in Herbert Park, where I met Eoghan Barry, Mairead Mernagh, Peter Forde and Jim Elliot. I think it was the day after the IFDA ball if I remember correctly. Anyway, from that point on, I was hooked, and playing in Summer League the following summer was just the sensible thing to do. Where did you play before Ireland, how did it compare? What level did you play at? My first exposure to the sport was in the summer of 1991, I was 18 and at a summer camp of some sort, and they taught it to us. I loved it immediately. There was this tall athletic guy on my team that could catch everything I would throw, and it made me feel like I was really good. In college, at the University of Colorado, I was working full-time and didn’t have time to commit to the Club team (which I regret to this day). But I played whenever I could. After college I joined the Boulder city summer league, and fell in with a great group of people (most of them law school students at the University of Colorado), and for a couple years played with those guys a couple times a week. But looking back it was just mid-level pick-up. Sadly, this all came to an end when I moved to Zaragoza, Spain in 1997. Leaving Ultimate Frisbee in Boulder was probably one of the saddest things I’ve ever done. And when I got to the desert that is Zaragoza, I was pretty sure my ultimate frisbee days were over. That didn’t improve much when I moved to Barcelona in 2001 either. I’d heard rumors about beach ultimate in Casteldefels, but was never that excited about ultimate frisbee on the beach, so never ventured down to check it out. It wasn’t until I moved to Ireland in 2007 that my personal ultimate drought ended. What appealed to you about ultimate? Everything. I was in love with it from the very first time I played. I hate running, but I love running with purpose. Ultimate gave me that purpose. I love the glory of a well-timed pass, or a full-speed layout. It just seems to combine the best of all other team sports. Plus, I love foot-blocks. Did you play for anyone before Jabba? No, not in any regular way. If I understand correctly (we’re going way back now), Jabba was actually created almost a year before I even came to Ireland. It was mostly a bunch of DCU guys. I’m afraid to name people, because I’m sure I’ll leave someone important off the list, but in those earliest of days, Jabba was founded by “Seb Berkovich” and Qed, and made up of Paddy Kelly, “Chip” McCann, Kev Ryan, Dan Farrell, “Dangerous” Dave Smyth, Ian Fox, Louise McKeon, Colm Bowden, Brian “Killer B”, Mairead Mernagh, “stein’ Monaghan, Carmel Guilfoyle and Sarah Meehan. I’m sure I’m missing some important names. By the time I came around, there were a few other non-DCU types involved too, like Shimbo, Ian French, Richard Buggy, Heather Barry, Paul Cronin, Emma Tracey, to name a few. Courtney Hosp and Keith Coleman joined around that time too. Well, originally, I was invited to play to help Jabba have numbers for winter league in 2007. I had played on the pick-up team at Cork Open, with Dan Farrell and Tall Paul, and suggested to them that we form a team for the 2007 winter league. They told me they already had a team, Jabba, and invited me to play with them. I still remember that miserably cold and wet night I showed up and everyone cheered because they didn’t have to play iron-man. I’m pretty sure we were bageled that night. I think it happened pretty often that winter, actually. Always miserable weather, down at the UCD astro pitches, but great memories. So I didn’t really have a role. Just another player. Paddy Kelly was captain at the time, but by the spring, he stepped down, and Ian French took over. In the autumn of 2008, when Ian took on the captaincy at Trinity, I was suddenly swept into Jabba’s captaincy before I even knew what hit me. I said a reluctant ‘yes’ to my nomination, thinking it would never happen. Before I knew it, I was captain. I had no idea what I was doing. And I think I was a pretty bad ‘field’ captain. I was still a student in the world of Irish ultimate. The main thing I think I brought to Jabba at that time was a bit of stability and some organisational skills. After that year, I did four year-long stints as treasurer. The other thing I got right as captain was recruiting Fiona Mernagh, Fintan Darcy, Amy Moffat, Adam Wyse, and Celine Campbell (among others). Today, it’s really hard to imagine a Jabba without those guys. In 2009, Jabba were awarded ‘Club of the year’ at the IFDA, and I think it was just because we endeavored to have weekly training sessions. My how the club scene has changed since those days! What was the ethos / philosophy / goal? In the early days I remember we would often debate between ‘having fun’ and ‘being competitive’. But I never quite understood the debate, since constantly losing games was really not that fun. To me, success as a team would come when those two things: fun and winning overlapped. I think Jabba started as a social club first, and eventually evolved into an Ultimate club. It was still several years before we started seeing those wins come consistently, but in the meantime, the friendships and the general craic we had both on and off the pitch were enough to keep us persevering through the disappointing results. The other thing that drove us in those early days was our desire to be a Mixed club. Our identity was rooted in this. During my captaincy we had two main achievement goals: win Mixed Nats (we came in 4th, just like the year before), and go to xEUCF (we came in 12th out of 13, winning our final game against an Estonian team on universe point – the only game we won that tournament). There seems to be a strong sense of identity / team spirit, talk about that. I’m not really sure how this came about, but it is definitely there. I think the main thing is that we just all really like each other. And I suppose when you combine that with so many years of being ‘the team with something to prove’, I guess we just developed a bit of an ‘us against the world’ kind of mentality. Like in most sports, I think teams (and their fans) are often defined more by their main rivalries, than by themselves. I do think this played into our progression as a club in the early days, when we were guided by our awareness of all the things we didn’t like about the other clubs. Consequently I do think Jabba has at times earned the reputation of being insular and cliquish. And ironically, that is one of the things we didn’t like about other clubs. Most of us don’t like that reputation for Jabba, but I suppose once you are actually in that position, it is hard to be arsed to do anything about it. Nonetheless, despite all the hype, Jabba really is made up of quite lovely people. Did you have a growth plan / strategy, you seem to have done it well. Every year we revisit our recruitment strategy, but back in 2008/09, this was one of the things we knew we had to get right for the very survival of the club. That was the first year we actively pursued players to join the club. And now that I think of it, in those days our main motivation for recruiting was to get enough numbers out to have proper training sessions, and so that we could have 7 on 7 games at training. Is Jabba a mixed team first ? If so, why? It definitely started that way, and yes, I think it still is. But this doesn’t diminish in any way how seriously we take the Open and Womens competitions. I believe we have reached an equilibrium where we adjust our focus based on the season. But, I still don’t think that has changed the fact that at the core, we are a Mixed club first. Jabba have steadily improved, what kept you motivated in the early days when you had to endure the odd bagel? Well, as I mentioned before, I think the main thing that kept us going in the beginning is that we enjoyed each others’ company. I personally don’t enjoy losing, and getting bageled is even worse. But to me, the hardest thing about the early days wasn’t in the results, but in the week-to-week, when we would routinely get only six to ten out for a training session. But at least if there were only six of us out there, we were definitely still going to have a good laugh. It must have been great when Jabba finally started winning All Irelands? Pure delight. Of course I missed it though. I was somewhere in Colorado in the middle of a coast-to-coast road-trip. But I celebrated with the guys over skype. Ian French, coach, how has he been good for the team? How? Where do I begin? If I had to name one person who has most shaped and influenced Jabba, it would be Ian without question. Not to take away from the valuable contributions of others, but I personally wonder if it weren’t for Ian during those early years, whether Jabba would have made it. That’s just my view. He’s sheer passion and energy. And he’s infectious. To me, the best players for a club aren’t just the superstars, but rather the people who make others around them play better. That’s Ian for you. He is great as a player. Even better as a coach. I think maybe I have a man-crush on him, actually. Talk about when you played the European / World clubs event in London, a tough baptism, but a valuable experience? How much player turnover have you had? Yeah, that one was tough alright. But so fun. As I mentioned earlier, we had lost six games, and were playing for 12th place out of 13 against the Estonian club. We had to dig deep and battle point for point with that team, and eventually won the game by the skin of our teeth on universe point. We returned to Ireland as winners! We have had a lot of player turnover. We lost a lot of people during that particular period, actually, around 2009. We’ve definitely lost some great players over the years. Some who didn’t like our style, or fell-out with individuals on our team and others who just thought they’d get challenged better in other clubs. No matter who they were, I was always sad to see people go. But having said that, since 2009 there has been a lot less attrition. Career highlights / Jabba highlights. My favorite personal moment was a foot-block I threw in a Mixed Nats game about three years ago. We were playing Trinity College, and I had the handler backed-up in his end-zone (thanks to my speedy chase after the pull), and I got my foot up just in time to pop the disc in the air. It came right back into my hands for a Callahan. My first thought was, ‘did anyone get that on film?’ No one did. It’s hard for me to pick one Jabba highlight moment. Maybe it was winning universe point in London at xEUCF. Or maybe it was the time we went 7-0 in Cheltenham at UK Mixed-Tour. (I think that has happened again since those days). It’s really hard to say, but I have loved seeing the club grow, and sharing in the success with all the friends I’ve made in the team. What’s next for Jabba, and you, are you retired now? Jabba are as ambitious as ever. Fiona Mernagh is the skipper now, and she is going to do great things. I have been voting for her for captain for years now, so I’m excited to see where things go. I’m also super-excited about Jabba Juniors. We have some amazing talent coming up through our development, which will guarantee a competitive Jabba for many years to come! Sorry to hear about the back, owch. Yes recovery time gets harder. I generally can’t bend over the next day, if I play a whole day of 3 to 5 matches. Much better to play one game a day for me now. In the meantime, I’ve been trying my hand at coaching and mentoring some of our newer players – just hoping I can make a difference somewhere. I think that’s plenty, but let me know if you have any other questions for me. Thanks very much, and possibly the speediest response too!